Last Saturday it was Sam’s birthday party. Sixteen years old. How did we get here? I can hardly believe it. Gone is my baby, the small innocent boy, and in his place is a fledgling man. He flexes his muscles, and chafes at a lack of independence. Detentions make no difference to his truculence in school. He is not tall, although his voice has deepened and his cheeks are rough. When I observe the sons of my friends my heart skips a beat at the height and breadth he does not share. Nevertheless, my boy is growing up, and I am proud. We took him and a group of his friends ten pin bowling. After a game in which there was much laughter and mutual helping and taking turns (no adult presence required), they shared a meal, and waited politely for cake and candles (it takes longer than you think to light sixteen of them, and a fair few puffs to blow them out). I can’t quite believe that this will be his last school-friend celebration, because in the summer, he leaves. He and his friends will be scattered to the four winds. It’s one of the reasons I am still throwing him a birthday party. His younger siblings have reached the stage where, other than the cake-and-candles and the gifts they aren’t really bothered (or, they haven’t made a fuss, anyway). Certainly by my sixteenth, where I went for a walk around the village and called in on a neighbour for a chat, birthday parties were long a thing of the past, but, as ever where Sam is concerned, his birthday, as well as him, offers me an opportunity. One of the things that happens when your child goes to secondary school is that you lose touch with the parents of their friends. For a long time, we were bound close, forged together in the crucible of the toddler group, the playgroup and the nursery; the cold hours waiting in playgrounds, washed with three o’clock rain. Whether this losing touch is peculiar to special schools, I don’t know, as even though he still needs delivering and fetching, I never have time to wait and chat; the vast majority of young people leave with a driver. For me, his party gives me the chance to connect with my peers, to find out how everyone is getting on. In a way, it’s restful. Despite the noise and lights, a sensory nightmare that everyone takes in their stride, meeting up with people who have been where you have been, who have walked by your side, even if at a distance, is a relief. At the last one I chatted with another mother about Sally Phillips’ documentary, a cultural event that continues to ripple over my community. Another time, a group of us talked about school, and how to fill in the multitude of forms that beset you when your child has a disability; the strangeness of finding yourself an appointee, together with a visit from the Official Checking Lady. And last week, the conversation turned to the longer term. It’s not a place I think of much. We are very much a right here, right now, cross bridges when we get to them kind of family, and it works for us. But the bridges are coming up alarmingly fast. Sam, at 16, is a young man confidently hurtling towards an uncertain adulthood. With all the talk about the cuts in spending to schools, right at the point when he is leaving and heading towards the realms of the college, is there enough money to support him there either? We talked about the possibility of starting our own business, the sort where we could provide our sons with both meaningful and safe employment and training. We discussed Team Domenica and Foxes Academy. I think about these initiatives and I feel proud and inspired. I think how great they are, how fabulous it is that there are people who are committed to making the future less frightening for families like ours. And then I think about how many parents are involved in setting them up, and I just feel tired. Sometimes I don’t feel equal to the task. It has got to that time of year when I start becoming aware that there are an awful lot of references to the summer on the telly. Every time there is a commercial break there is some sort of temptation to book a sun-sea-and-sand-all-expenses-paid extravaganza. Families jump in and out of swimming pools/turquoise oceans/treehouses, celebrities get marooned on desert islands (with a camera crew). Robson Green was the latest recruit, I saw. I have to admit I am very fond of RG as a documentary presenter. There is something about his self-deprecating enthusiasm that makes me smile and emit the odd surprised snort of laughter, whether he is catching a fish that was THIS BIG (I have no interest in fishing) or finding himself inelegantly stuck half way up a palm tree in search of a coconut. He has the ability to make the odd comment that I find myself filing away for the future (‘my dad used to say, “failure’s an event, lad, not a person” ‘ is the latest). It’s almost enough for me to put his brief foray into World of Pop to one side. Almost. We, as a family, are, however, surprisingly immune to the lure of sun-sea-and-sand telly. Until the kids and I went to school and entered the timetabled bond of terms we took our breaks decidedly out of season. There’s nothing quite like being on holiday in the wind and rain, determinedly being in the Outside with the hood of your cagoule tied firmly under your chin after all, and I, awash with sentimentality, of chlorine-fragranced memory, am decidedly fond of a spot of swimming through ice-pin prick raindrops. Theres something about returning to the same place again and again, interspersed with the passing of years which brings them on, those memories. When you arrive, when you turn an unexpected corner, when your senses are assailed with sounds and scents that seem unchanged, you catch a glimpse of an earlier version of yourself, your child; your memories march, or flit, unbidden, into consciousness. There’s the time I realised he listened to me after all; that he understood the stories and the songs as he, tiny in his all-in-one-against-the-ever-present-rain ‘woo wooed’ his way around the park, a trip around the perimeter in a carriage pulled by a Land Rover enough to make an outing. And the time, my moment of disaster, when I stood at the bottom of my metaphorical mountain and realised that I could not go alone – but that to ask for help was not sign of failure, but of community. There were times when watching squirrels and baby deer was enough, and when we, as new-ish parents found that what we needed was time to play together, to be the people we were before, together, and that we could make those moments happen for ourselves; the time I waited, new baby tucked inside, in the cold and the rain, telling stories at the train-stop, an ever growing crowd of little ones, sidling closer, the teacher gone, but not forgotten, awaiting her return. And now, this weekend, a new set of memories to add to the store. An adventurous young man, whizzing down water slides too fast for his mother, and almost too fasts for his rather surprised papa. Reading the menu – and sending it back when the dish arrived and wasn’t as expected. A presumption, and not, for a change, of difference and disability, but of competence. A girl, unbidden, checking that a float was finished with. A high five, testament to a shared nervous moment with a fellow ‘twister’ traveller. It’s not easy letting go. It’s not easy standing by and allowing him freedom – to make mistakes or hurt himself, as well as experience success. It’s not easy watching him take his first steps away. But it seems to me that unless we do, unless we allow, and encourage, this growing up, if we disallow his alienation from the ordinary things of life, and refuse to give in to the fear, the greater the chance for him that he won’t be seen as as some sort of strange, unknown creature from an alien nation. 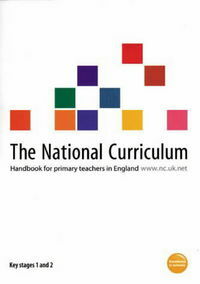 I remember the first National Curriculum, or I should say, the first primary national curriculum (secondary remains a ‘here be dragons’ kind of place to me, a mystery full of grey corridors and children wearing blazers). Introduced following the Education Reform Act of 1988, the year of the GCSE, it was rolled out in primary schools in 1989. By the time I started my PGCE in 1993, teachers were getting the hang of it, even if it was an extraordinarily cumbersome document. I remember the day I took my copy home from college, so that I could read and inwardly digest; I struggled down the road with two carrier bags and a couple of folders tucked under each arm. Now, I have to admit to a certain weakness for stationery. I used to spend hours, as a teenager, choosing my new pencil case and the ring binder I would hug to my chest in the way of teenage girls before the start of the school year. I was secretly envious of my sister’s collection of smelly rubbers in the shape of fruit, even thought I had a collection of my own (mine were from National Trust properties and museum shops, the only thing, bar the bookmarks, that I could ever afford to buy). I stacked the brightly coloured folders (one colour for each subject, English was yellow, maths blue, music pink, geography brown) (actually, now I come to think about it, this is probably the reason why I am always disconcerted if maths and English exercise booked aren’t blue and yellow respectively) on my student desk and sighed a deep sigh of satisfaction. I used to know it well. Every half term and holiday, I would consult it, just to check that I was teaching what I was supposed to; I would enter in, on the planning form we used, exactly which points I was covering, down to the a,. b. and c. I filled in Modbury books, and highlighted handwritten objectives, to show what was covered. When I (hand) wrote reports, I would pore over the level descriptors, to make sure I knew where the children were at in terms of their progress, and what I could usefully tell their parents. That said, I was glad when it was slimmed down a bit. It took up a rather large amount of space in my teacher cupboard (along with all the things that everyone else was looking for and that I had forgotten I had stashed in there). Doing my planning became a lot less complicated (especially maths, I recall, with its pull out diagram of what went where), although every little tweak and change made you feel like you had to work from scratch all the time. They kept the colours though. That was nice. These days, the National Curriculum is a very different document indeed. Gone are the colours (it’s serious knowledge, after all, none of this playfulness associated with children, please), and in their place are lots of important sounding words, like narratives, summaries, linguistic knowledge, transcription, morphology, geometry and algebra. It feels aspirational and…muscular. There’s a lot of Knowledge in it, dressed up in those important sounding words. So much, in fact, that spelling, vocabulary, grammar and punctuation have two statutory appendices of their own. Now, I know it feels a bit like having a moan a long time after the event, in the manner of shutting the door after the horse has bolted, but still; and I’ve got nothing against knowledge – there are lots of interesting things in the world, and I am interested in lots of them. But it seems to me that in our quest for knowledge, and the kind of National Curriculum Knowledge we statutorily strive for, in the seriousness of the document (despite the odd ‘joy’, ‘treasure house of wonder’, ‘imagination’ and ‘curiosity’ here and there) that we have forgotten something really important. Maybe primary teachers feel like second class citizens, constantly constructed in the popular imagination with glitter and glue, as if all we do is play at teaching, and we leave the hard stuff, the stuff of subject domains, the treasure trove of facts and knowledge to our secondary colleagues. Maybe it’s that we wanted a bit of the seriousness of the endeavour to be placed upon our shoulders too, I don’t know. No pictures or colours here. This is Serious Knowledge that needs Serious Learning. The thing is, though, that I know that many primary teachers are not happy with the Way Things Are in their classrooms. They aren’t happy at being forced, by overly prescriptive assessment criteria that drives what ends up being taught, to teach things they know are wrong, or silly (exclamatory sentences, anyone?). I’m not happy with the things I’ve seen, when I’ve been driving round the county, reading the books, full of what the children wrote. But maybe the solution lies with us. Maybe we ought to have a bit more professional confidence. Maybe we ought to say a bit louder that if children are going to be asked to write, then they need something to write about. Maybe we ought to point out that the primary curriculum has art and music and science and technology and computing and foreign languages and RE and all sorts of other lovely things in it that would do that very job. If only we had the time to teach it. Or the time to think about how we would do it in a meaningful and joined up way that makes sense to the developing child. It strikes me that if we don’t, if we do the compliant thing that answers the order, ‘jump1’ with ‘how high?’, if we can’t find a better answer to the accusation that we are against knowledge and against learning than treating children to a narrower and narrower curriculum – for everyone, not just those with SEND – in order to justify ourselves, to prove that we are Serious Creatures, not frivolous ones in love with fun, then we are in danger, by forgetting that you don’t have to learn ‘this’ before you can learn ‘this’ (i.e. the ‘treasure trove of wonder’ is to be found in the primary school too), of creating children who appear to know it all, but actually know nothing. And in the meantime, while we struggle to keep up, we are distracted from commenting on the funding bubble that is about to burst and the slow but steady creep of the neoliberal trap. I don’t always make good decisions. There. I said it. Sometimes I make decisions in haste, and live to regret it, sometimes I take my time over it, make lists of pros and cons, and I still get it wrong. It’s almost enough to put me into a state of permanent stasis. Almost, but not quite. Jobs are one of the things it is possible to get spectacularly wrong. Unlike a pair of shoes that rubs, or that doesn’t quite fit when you have your socks on and you try them on at home, or the top that you thought looked so great in the catalogue, but when upon your self makes you look not unlike a deeply unattractive and shiny sausage, straining at the seams in a most unseemly way, a new job, and especially a new teaching job, is not the sort of thing you can take back, receipt in hand and ask for a refund. I’ve done it more than couple of times now. I’ve taken a job that, on the surface, ticked all the boxes it was possible to tick, but turned out to be one big fat mistake. You’d think I’d learn. Sometimes, though, the consequences of my mistakes aren’t as immediate as a bad fashion choice or finding myself as the wrong person in the wrong job. It takes me a while to realise that the decision I made, the leap I took, went in a direction that wasn’t the right one for me. I should have listened more carefully to my dad when he went on (and on) about disco deafness and I carried on (and on) going to discos and gigs. I am reminded of the consequences of my actions every night when, instead of the telly, or the soft clicks and creaks of a house settling itself down for the night, I am washed with the crashing of the sea, the squealing and ringing of tinnitus. I suppose I could blame my dad for not buying me ear plugs, or doing something to reduce the volume in my headphones. As far as work is concerned, I could blame the economy, or better, politicians, for forcing me to work to help to pay my mortgage and support my family financially, or the pressure from family or friends to live and work in a specific place, thus narrowing my ‘career’ options. I could blame my bad shoe choice on the traffic warden, or demands for an early lunch, hastening my exit from the shoe shop without proper consideration. I could blame every other thing, and every other person for my choices, if I so desired – that’s what everyone else does, after all. You see it all the time, this shift of responsibility from your own shoulders to those of someone else, especially when we make a bad decision, or one we suspect might be, well, suspect. I forgot my homework? The unicorn ate it. I broke the prize ornament? It wasn’t me; my brother made me do it. But while the childish excuses for forgotten homework (I was in the middle of a really, really good book and I just had to get to the end) or smashed ceramic (the game of balloon tennis was especially exciting and we got carried away) might be essentially harmless, the older I get, the more I learn, and read and listen to the justifications for action in one direction or another, the more I am disturbed. Because it doesn’t seem enough, to shift the blame from our own shoulders, not any more, not for us adults. Instead, we must justify our actions in no uncertain terms. It’s not enough to push it away from ourselves and point it somewhere else; we must make monsters of our scapegoats too. ‘It’s the parents!’ we declare, when the children in our classrooms won’t do as they ought. ‘It’s a lack of discipline at home!’ Or morals, or values, or boundaries or bedtimes, or whatever else we think they are lacking. And, before we know where we are, they become easy to ignore, the imperfect adults on the other side of the school gate, to override as almost incidental in the process of bringing up baby. We are the professionals, after all. ‘It’s the children!’ we cry into our glasses of wine and our social media at the end of the day, retaining our profession deep into the hours of the night, or the weekend, or the holidays. If they won’t do as we want when we want and how we want there must be something wrong and OUT! OUT! OUT! No excuses. Our way or the highway, and if they choose the highway it’s because there is something wrong with them not us. I get it, I do. No one wants a hard time. I don’t want a hard time. No one wants to make their life intentionally more difficult, more full of hospitals or responsibility than anyone else. But it shows me something. It shows me that an exaggerated story, told enough times by enough people can start to be seen as the truth. It shows me that when we shift the responsibility for our own decisions onto the shoulders of someone else, when we over-egg the pudding in order to ensure that we come out of it looking good, spotless and shiny, no moral qualms allowed, no doubt, no admission of our own human frailty, when we do someone else down in order to make ourselves look good, what happens is that children like mine end up cast into the pit, like demons.